This lily must be planted in very early Fall (other lilies such as Asiatic and Oriental hybrids can be planted later in Fall or, preferably, Spring). Be very careful to avoid damaging the roots. Madonna lilies are not planted as deep like other lilies and must have 1-2" (3-5 cm) of soil covering the nose of the bulb. Plant in a rapidly draining, calcium-rich soil (pH 7) in a location that receives plenty of light but not too much direct sun. Plant among ground covers and bulbs left in the same location will act as perennial plants. Its dazzling white flowers stand at right angles to the flower stem and smell positively delicious. Each flower stem can provide 10-20 flowers. Long regarded as a medicinal plant, the flowers have been used to produce perfumes. Needless to say they make wonderful cutflowers to bring their fragrance inside the house. In borders, beds with perennial plants and as cut flowers. 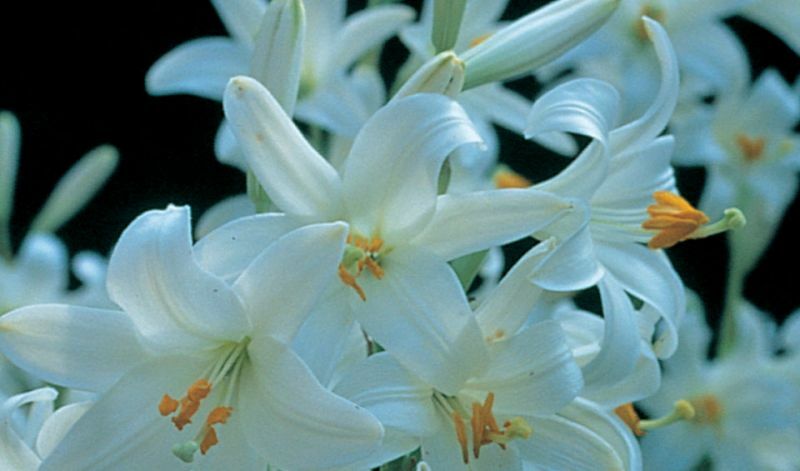 * PLANTING NOTE: unlike other lilies do not plant deep, top of the bulb should only be covered with 2" (5 cm) of soil. Adjust your planting dept according to the size of the bulb.